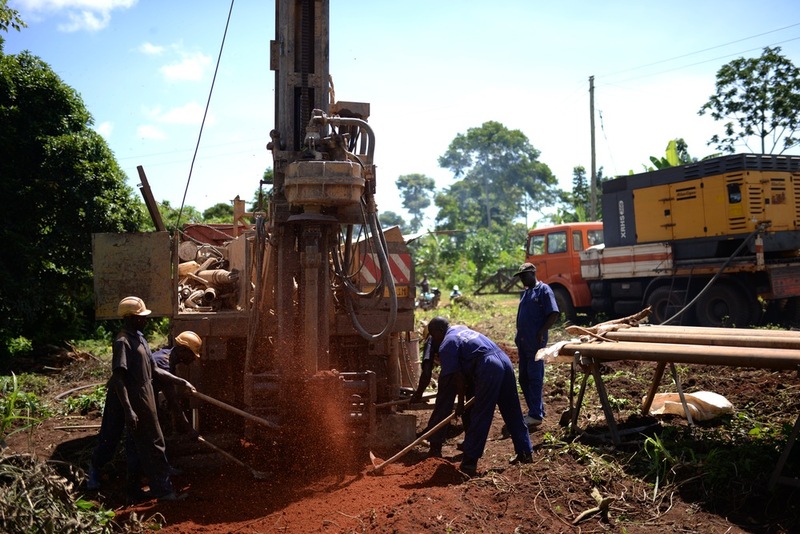 After three weeks of hard work with our friends in Uganda, we are excited that we now have TWO wells. If you're not aware, it does take longer than a few weeks to get a well completely functioning, but our team was there to ensure a lot of the "legwork" was done efficiently and successfully. 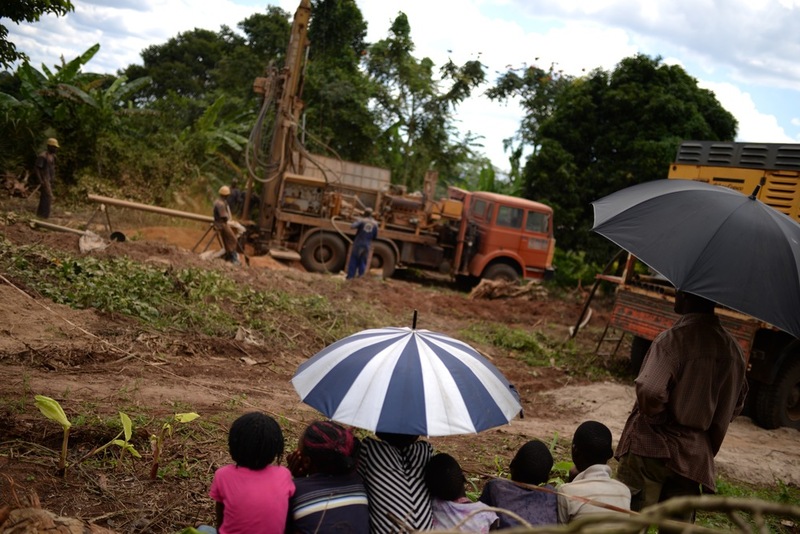 In addition to the drilling of the borehole, we needed to dig trenches and lay pipe to ensure the water could be brought from the well to the locations that need it: our agricultural operations and several family homes! This required us to hand dig over 2,500 feet of trenches, and, once the water was found, make sure that the pipes carried the water properly, without any leaks. Our team of three (myself, Geoff Hartnell and Josh Kurtz) worked together with our cooperatives and students to make this happen--beginning our days with prayer before the sunrise, and working until nightfall, or even a few times, through the night. We also created tank stands to hold the 10,000 liter tanks that will hold water and gravity feed it to the various areas. We accomplished all of this during our trip! 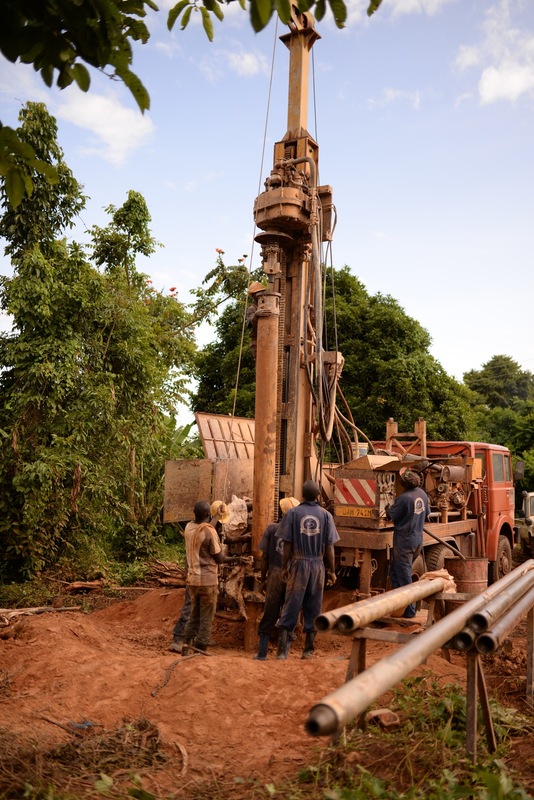 While we did that, the drilling team used their heavy machinery to drill holes deep enough to find water in the areas they determine are most geologically likely to hold water. It was a stressful situation as we only got four "tries" to find two successful locations, but praise God, we found them! 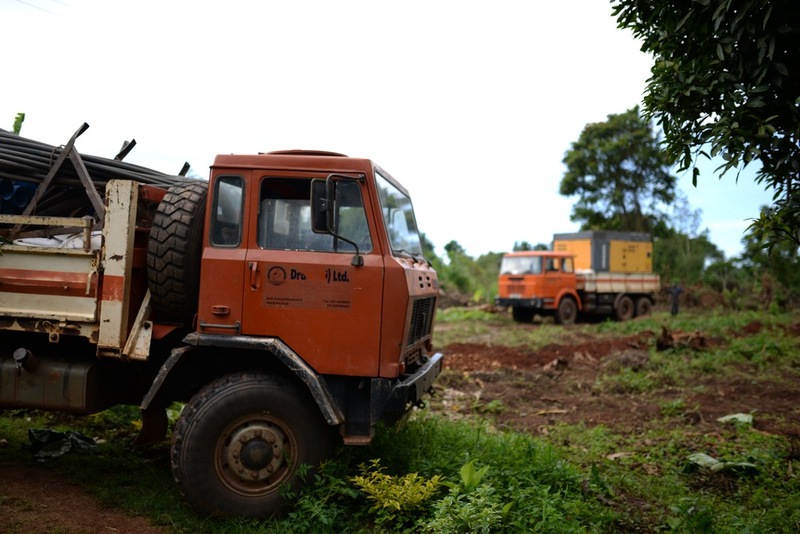 The team that drilled said that our land was some of the most difficult they've ever encountered, with drilling taking over twice as long as usual. Though many times were uncertain, we kept praying that God would work it out, as we know the many lives dependent upon this water source. We would break and gather as a community to pray for God's favor. We are so grateful he heard us. At this point, we are still in the process of testing the water (to know how much filtration, if any, is required to drink it), connecting pipes, running electricity to the pumps, placing the water tanks on the stands, and testing pipes for leaks. But we have water! To everyone who contributed to making these wells possible: THANK YOU! The community at large is so grateful for this incredible gift. Every day that we were there, the mothers and children would sit and watch the process, in anticipation of the blessing they were about to experience. (In Uganda, only 4% of the population has water piped to their homes.) One evening after a full day of installing pipes to bring water to our garden, one of our cooperatives, Lawrence Ssemakula, expressed how thankful he was that his children wouldn’t have to know the difficulties of obtaining water as he did. He recalled how, for years, he would have to wake up at 3am to begin gathering water for his family each day. The process would take hours and required carrying heavy containers long distances. Praise God his children will not have to know this hardship. We pray that many more are spared of this kind of hardship as we continue to bring water to those in need. families have water! Thank You!